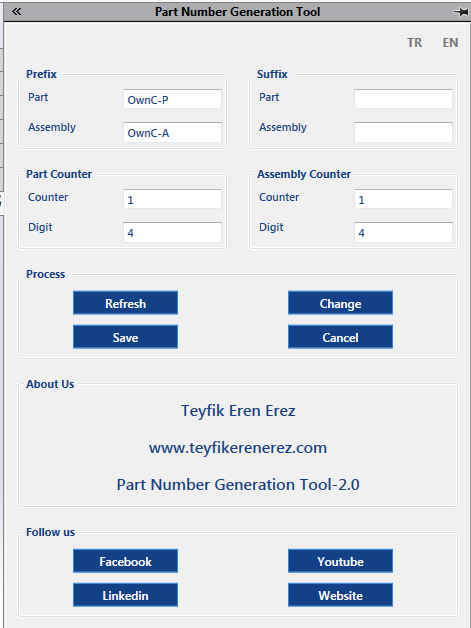 First of all, I would like to thank Teyfik Eren Erez for a nice tool that generates the serial numbers. This tool generates a new file name (from serial number generator) for SOLIDWORKS files and is designed mainly for either small teams or a single designer. The user only has to fill out the boxes for the prefix, the suffix and the assembly. However, in this article, I would like to explain how to use this tool according to the variables system proposed in the “CAD Administration Handbook for SolidWorks”. All the rights for this program belong to the creator and the latest version can be downloaded from here (mirror). We’ve used this tool ourselves and have experienced no issues, however use caution and test it out, before going all in with this (or any) application. The application uses different counters for both Assembly and Part. This means that the Prefix and the Suffix must separate the file type. It’s not a good idea to have both use the same file name. The configuration is simple and should be fairly straightforward. Regardless, the author has made some really nice instructional videos that are also available from the download link. I recommend adding “P” for part and “A” for assembly as simple identifiers into the Prefix. This will later help to sort the assembly files. However, the situation with sorting becomes a different story if you only send PDF files to the supply chain or the supplier. Should you choose to use a single configuration, set the custom property’s “IDNumber” value as $PRP:”SW-File Name”. When done like this, the file name will always be shown as an identifying property. When only using the built-in numbering system in SOLIDWORKS, there is no need to add the “IDNumber” property. Multiple configurations in a single document will need a simple trick to use the configuration name as part of the “IDNumber” property. In this particular case the file name and the configuration name are not same anymore. The file name will be OwnCP-P0002 and the ID will be OwnCP-P0002-010. Set the drawing names according to the “IDNumber” value as the names of it and the drawing must match. As of today it’s impossible to use the same serial number in a workgroup. A simple workaround is to give every engineer their own number format. It’s quick and dirty, but very effective! If you want to know more, such as what the abbreviation of “OwnC” stands for, be sure to check out the CAD Administration Handbook for Solidworks!